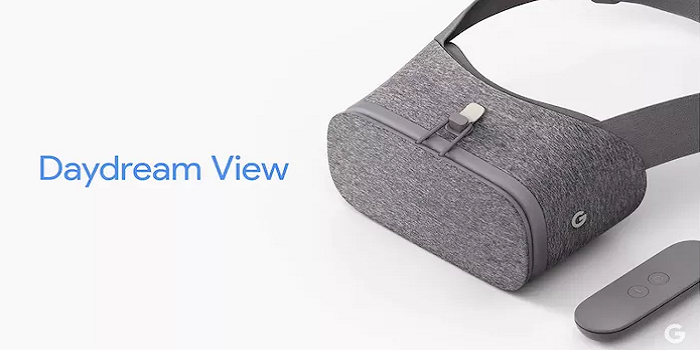 The Daydream View virtual-reality headset was another significant piece of hardware introduced in Google’s San Francisco event Tuesday, October 4th. It was first announced in May at Google’s I/O. At only $79, Daydream packs a “Good enough” controller and VR headset into a single box, allowing anyone with a brand new phone (for now only working on Google’s new Pixel and Pixel XL phones) to experience virtual reality. The Daydream View is made of soft breathable fabric and its comes with a controller which lets you interact with the virtual world the same way you do in the real world. It points where you point, and is packed with sensors to understand your movements and gestures. The controller slides right inside the headset when not in use. As per weight, Google says the device is “30 percent lighter than similar devices on the market today.” Google probably means the Gear VR, which weighs 318g without a phone. However, it has been confirmed that the Daydream View weighs 220 grams. Weight is extremely important for a VR headset—lighter devices are more comfortable, which lets you play longer without fatiguing. Powered by Android 7.0 Nougat, Daydream-ready phones are built with high-resolution displays, powerful mobile processors and high-fidelity sensors—all tuned to support great VR experiences. Connected phone and the headset have an auto-alignment system so you don’t have to worry about cables or connectors. Google has packed some of the most popular Google apps into VR. With YouTube, you can watch the entire library of videos on a virtual big screen and experience immersive videos from creators like Buzzfeed, e.t.c. Use Google Street View to see curated tours of more than 100 of the world’s most amazing places like the Pyramids and the Taj Mahal, or just search to explore everywhere else. Presently, CCP has announced in a press release that Gunjack 2: End of Shift will be exclusive to Google’s Daydream platform, and will be released next month. The game is in development at CCP’s Shanghai studio. Google Play Movies makes tens of thousands of movies and TV episodes available in your own virtual theatre. And Google Photos displays your 360° captures in a whole new way. At launch, Daydream View will come in one color of headset and controller, called slate. Later in 2016, it will add “snow” and “crimson” versions, both of which will come with an off-white controller. In the US, preorders for Daydream open on October 20th through Google, while the headsets will go on sale in early November at Best Buy, Verizon, and the Google Store. Google Daydream View will be available in November in five countries namely US ($79), UK (£69), Canada ($99 CAD), Germany (€69) and Australia ($119 AUD). It will be available for pre-order starting October 20 at Verizon and the Google Store.